We have many great attractions here in Loudoun County. Even so, everyone must have a change of scenery now and then. 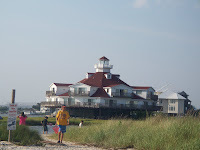 One of my family's favorite weekend or vacation getaways is the beach; we go once a year. 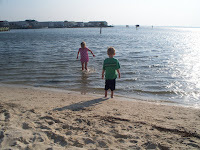 The closest beach to us is Ocean City, Maryland, about a 3 to 4 hour drive from Loudoun. Although Ocean City is often criticized for being overly commercial; it just so happens that I like to have lots to do on my vacation! No matter your likes or budget, there is no reason to be bored. OC has some of the finest ocean front hotels, although during peak season (and with the kids) we now opt to rent a condo on the bay side. Our favorite place is Sunset Island, a new gated community with tons of amenities. Condos are generally half the price of a hotel room and double the space; and since we have a full kitchen, we save on meals, too. Off peak, when it is easier to get a bargain, or for quick romantic weekend getaways, my hubby and I still stay in an ocean front room so we can enjoy hearing and seeing the ocean from our balcony. But, watching a sunset over the bay is awfully nice, too. In season, FREE family entertainment is offered every night of the week. On the boardwalk, on the beach, in the parks... you'll find roaming entertainers, concerts, magicians, movies, family games and more. One of our favorite past times is simply walking the boardwalk. At night, the place lights up like Vegas. It's a great place for window shopping, people watching and checking out the latest beach trends and funny T shirts. You can rent bikes or take the trolley up and down the boards… and the kids love to bring extra bread and feed the seagulls. Boardwalk food includes such specialties as Dumpser's banana shakes (my favorite), Dolle’s carmel popcorn, Candy Kitchen's fudge and the world famous Thrasher's boardwalk fries.....it may not be health food, but it is way too good to be called "junk food". You'll find several arcades to compete for your business. A long standing tradition in our family includes the "quarter sock" where we save quarters as we near vacation time (and yes, we keep them in a sock - I don't know why, ask my husband). Those are the quarters that are used to play arcade games in OC, which pay out tickets that can be saved to purchase prizes. For the weeks preceding our trip, when the kids act up, my husband just grabs and shakes the sock – and their behavior magically improves. This year, with a 3 and 6 year old we skipped the arcade and headed to the 2 amusement parks: World Famous Trimpers Amusement Pier which has been in place for over 100 years; and Jolly Rogers Amusement Park which boasts itself as OC's largest Amusement Park. Both feature carnival like rides and games. Jolly Rogers has a second location off the boards; and also operates Speed World (a park of go karts and race tracks) and Splash Mountain (a water park). If you like water sports, you'll have no trouble here. You can rent pontoon boats, wave runners, or jet skis to ride in the bay. You can jump aboard the OC Rocket (a large speed boat); take a chartered fishing trip or a nature cruise...options abound- pick up any local coupon book or map and you'll find a list. I personally like the sunset dolphin tours. The nature cruise to Assateague was very nice, and educational, This year, we opted for a Pirate Adventure, where the kids became pirates for a bit and joined the ranks of the crew aboard The Gypsy. The pirates fought off the bad guys and found the treasure; and had a lot of fun doing it. Another highlight for us is visiting the wild horses (referred to as ponies) at Assateague Island, a nature sanctuary (both a state and a national park) just about 15 minutes from Ocean City. You can arrive by boat or car; and camping or picnics are allowed. There, wild ponies roam, along with deer, many birds and other types of wildlife. You can rent a kayak to explore the back bay, rent bikes to explore the island, walk along the beach or trails or just drive through....you can generally get a few good looks at the wildlife, even from the car. This beach is less frequented than the one in OC, and is therefore a great place to find sea shells. Even though we're penny savvy, we always go out to dinner - there are so many great places to choose! Mackey’s is one of our favorites. 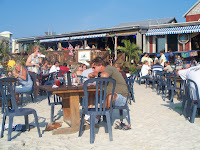 It's on the bay, and we eat at outdoor tables in the sand. The kids can play in the water while we enjoy a beverage and watch the sunset. And, what is vacation without dessert! Donuts from Dunkin Donuts are a family favorite, but OC is better known for ice cream and specialty candy shops. Ocean City is truly a delicious place! Oh, but wait - did I forget to talk about the beach? Yeah, they have one... and it is great. In season, come early to get your spot among the sandcastle builders and the sun-worshippers. Resting on the shore, soaking in the sun and listening to the waves crash is one of my favorite past times. The kids enjoy feeding the seagulls chasing the waves and burying each other in the sand. If you're a swimmer, be careful - the Atlantic can be quite moody. No matter how diverse personalities are in your family, OC is sure to have attractions for everyone - night life, relaxing beaches, nature sanctuaries, amusement parks, water sports, gourmet foods, history and museums... the list goes on. All this is available, just a short drive from Loudoun, keeping it easily accessible, even for the occasional day trip. Make some time and visit soon! …. And, stay tuned to learn more about Living In LoCo!